Evolution of the London Hospital badge. Badges Awarded to Nurses at The London Hospital from 1931 to the Present Day. 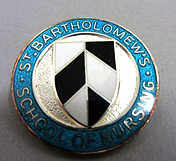 Many Hospitals started awarding a badge to their qualified nurses in the early 1900's: although many were League badges such as that awarded by St Bartholomew's (see picture below). Their first badge in 1900 was given to Mrs Ethel Bedford-Fenwick who was a huge supporter for the registration of nurses and the Three Year Course - unlike Eva Luckes who strongly preferred the Two Year Course (A). 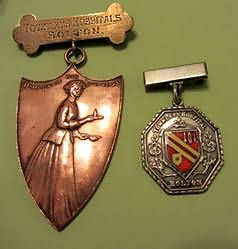 Mrs Bedford-Fenwick was also the recipient of the first General Nursing Council badge in 1922. 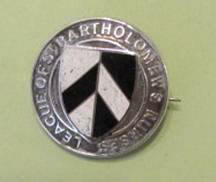 Above: the badge of The League of St Bartholomew's Nurses, circa 1940. Many more hospitals started awarding badges in the 1920's - such as the Nightingale awarded first in 1926 to nurses qualifying from St Thomas's Hospital. Prior to this some nurses bought a generic badge, such as the one shown below (left), which is shown alongside a later badge (right) awarded by the same hospital. 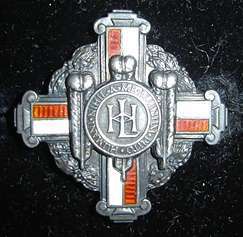 Prior to Nursing Education moving into the University sector in the 1990's, hospitals were often associated with specific badges, which when awarded on successful completion of nurse training (many hospitals only awarding the badge if the internal final examination of the training school, known as "Hospitals" were passed, this exam was often separate from the exams to achieve State Registration. Such badges are iconic, and were often worn with great pride by nurses who often felt very loyal to their training hospitals. This sense of loyalty to a specific hospital/group of hospitals has perhaps been lost somewhat due to repeated changes and amalgamations of training schools, and along with this the sense of historical achievement of great nurses can be lost. Perusing a copy of Burdett's (1896-1927 Burdett's Hospitals and Charities, editor Sir Henry Burdett) shows what some of these early nurses achieved ...some travelling around the world to develop nursing in the late 19th century, others going to the Crimea with Florence Nightingale in the 1850's, or the achievement of uniform Nurse Registration for all by Mrs Bedford-Fenwick and her supporters. Some of this heritage used to, and still can, inspire nurses towards excellent nursing care, for example, knowing about whose footsteps they follow in. The London Hospital badge was first designed in 1929 with the first one being presented to Queen Mary (this can sometimes be seen in old photographs being worn by her when she visited The London). Note the enamel colour change in the later (1984) badge. The earlier two were made by John Pinches, the later by Thomas Fattorini. 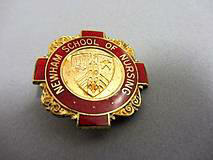 Above: the badge awarded to State Enrolled Nurses qualifying at the Princess Alexandra School of Nursing. Pupil Nurse training was established at the London Hospital in 1967 ending in 1989. It has the same colour red enamelling as the earlier two versions for State Registered Nurses which were both made by Pinches (who were bought by the Franklin Mint, in 1969). 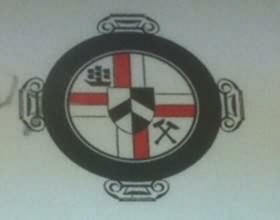 Fattorini's then took over production of the London Hospital Badge. In 1967 The London Hospital school of nursing was renamed to that of The Princess Alexandra School of Nursing and was opened in new purpose built buildings, which were finally "mothballed" in July 2012. The buildings included an original round lecture theatre, and an ingenious system of flashing lights in each room, used to summon nurse tutors and lecturers. In 1988 The Princess Alexandra School of Nursing became the Princess Alexandra College of Nursing, reflecting changes in nurse education, and two years later in 1990 merged with Newham College of Nursing to become the Princess Alexandra and Newham College of Nursing and Midwifery. 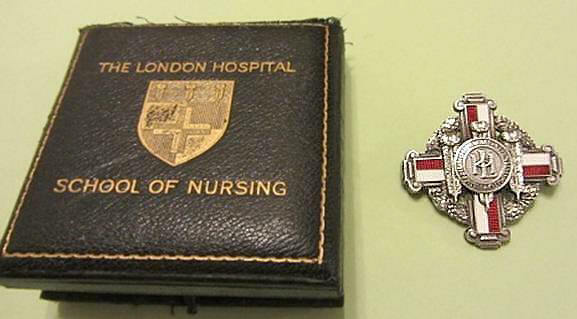 Anecdotal reports say that nurses qualifying in 1992 resisted strongly against receiving the new badge, and were awarded with the original London Hospital badge style as above. So far there is no record of what badge had been offered as an alternative/new badge. 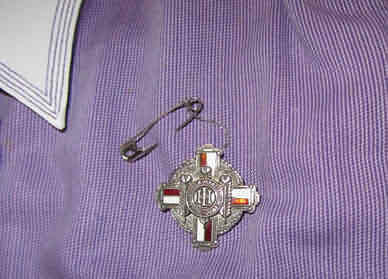 The London Hospital Badge as worn on Staff Nurse uniform by author. This period saw the amalgamation of The Princess Alexandra and Newham College of Nursing and Midwifery and St Bartholomew's College of Nursing. Fig 3 - Currently this is the only image to be found of the badge awarded then, it is on an invitation to the annual badge presentation. Elements of all three badges: The London Hospital Badge, (awarded to nurses qualifying from The Princess Alexandra College of Nursing) St Bartholomew's College of Nursing and the Newham College of Nursing badge can be seen in this design. Fig 3 - NB: Whilst the invitation above is for 1993, the college had already merged with again City University in the same year, but presumably this presentation and badge was for nurses who trained from 1990 -1993. Fig7 - Presumably this badge was also altered to reflect the alteration to college status. Fig 8 - There is a version of this badge which says College of Nursing, first awarded in 1989). Led by Miss Edith Parker (1932-2012) a group of Nursing Tutors designed this badge for the Project 2000 programme which started at the Princess Alexandra College of Nursing in September 1993 ( there were only 2 cohorts the second intake in Spring 1994) because the school and Bart's merged in 1993. This badge was produced by Fattorini's (both makers stamp and hallmark on the back) as a result of the Newham and Princess Alexandra School of Nursing merger. 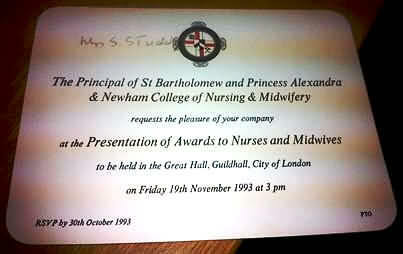 In 1993 The Princess Alexandra School of Nursing merged with that of St Bartholomew's and in 1995 became the St Bartholomew and Princess Alexandra & Newham School of Nursing and Midwifery of City University. 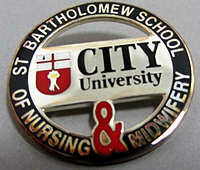 A City University badge was designed and was issued to all student nurses and midwives who qualified via a degree or diploma programme at City University. A City University badge was designed and was issued to all student nurses and midwives who qualified via a degree or diploma programme at City University. The College had merged with St Bartholomew's College of Nursing to become; City University, St Bartholomew School of Nursing and Midwifery. Fig 11 - This badge was awarded from 1998(3), and shows an element of the Lord Mayor's Coat of arms (Chancellor of City University). It does not reflect the combined heritage of all the placement hospitals that nurses in training visit in the City/East London area, whilst not all placement hospitals can be acknowledged on a badge- the result is that historical links can be forgotten. Within the Nursing Department at City University the historical links are maintained with the naming of rooms after prominent Nursing and Medical professionals from both major hospitals used as placements. The statue of Edith Cavell (from the now closed Princess Alexandra College of Nursing) being placed outside the room named after her, and The Bedford-Fenwick room being named after Mrs Bedford-Fenwick. 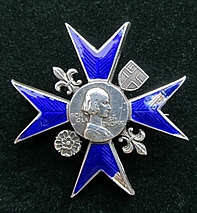 The badge is silver and it was awarded until 2011. Fig 10 - Presented to the first recipients in 2012, graduating from City University, London in Nursing and Allied professions. It was designed by a Nurse Lecturer (who qualified at The London) and shows the Lord Mayors Coat of Arms, as the Lord Mayor of London is the Chancellor of City University. The badges shown above highlight the rapid changes experienced within nursing education in the late 20th century. From 1931-1993 two badge designs were awarded at The London. After 1993 a further 5 badge designs have been awarded. It is hoped that these new badges are worn with as much pride as nurses used to wear their hospital badges; pride in the institutions where they study and nurse, with a sense of real achievement. Hospital badges often had many historical clues pertinent to that particular place within their design, also giving the wearers a sense of identity. Much is said about nurses not wearing badges whilst caring for patients due to infection control and patient safety. In my personal experience as a nurse and patient they can help open topics of communication. Despite showing official employers I.D. on every new visit, many of the District Nurses I worked with were greeted by comments about our hospital badges - "oh- you are proper nurses then"! A badge seemed to many patients and their families to denote official recognition of the wearer (B) and to many patients gave a sense of comfort. In the East End of London many people recognised the London Hospital Badge - the wearer being one of "their" nurses. When working in Kent a patient would occasionally admit that they had trained or been nursed at The London, opening up further ways of establishing a good therapeutic rapport with the patient. A. Mrs Ethel Bedford-Fenwick, prior to her marriage to a doctor at Bart's, was Matron there from 1881 to 1889. (Until the second world war nurses were unable to continue working once married). Miss Eva Luckes was Matron at The London Hospital from 1880 until her death in 1919. B. General Nursing Council (G.N.C.) 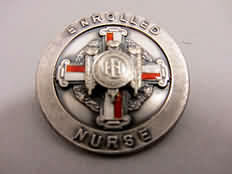 for England &Wales Badges were engraved with a unique number for each nurse, and were used to help prove that the nurse did have the qualifications which they claimed, with each extra qualification gained requiring the badge to be returned to the G.N.C. for the qualification and and next unique number to be added. They were much as certificates later became, and today perhaps statements of entry onto the Nursing Midwifery Council register. G.N.C. S.R.N. badge, Fig 15 showing the reverse aspect detailing the unique unique registration number/s of the recipient. The SEN (and earlier S.E.A.N.) badges contained much the same information until the full details were modified, in the early 1970's, to include only the branch of nursing and registration number in an effort to prevent fraudulent use. After 1983 the G.N.C. became the United Kingdom Central Council for Nursing and Midwifery (U.K.C.C.) and these badges were no longer awarded to much to the sadness of many nurses sadness. An alternative was eventually sold to some, but this didn't have the same appeal and was not really successful. Archives @ City University, The Royal London Hospital Archives Archivists, The President of the Royal London Hospital League of Nurses, Harry Rogers (proof reading, editing and photography) and Will Burgess (editing). Figs 1-5, 10, 13-16. Copyrigh t - Authors own. Fig 3. Royal London Hospital Archives.